To thrive in a city requires a unique kind of fortitude. Monk Oil’s nourishing ingredients help support both inner and outer well-being. Monk Oil contracted myself and my colleague to come up with a unique sky functionality for their website. Based on the work we did for the Long Road Society, they wanted a sky that would change whether it was dawn, dusk, dark, or day. This was a really fun project. 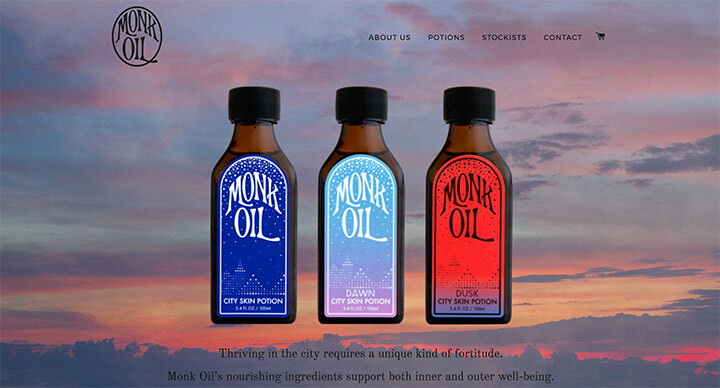 Monk Oil has some attractive packaging and branding which helped showcase this new functionaltiy.